Century-old oak trees and an old iron fence mark the borders of Mt. 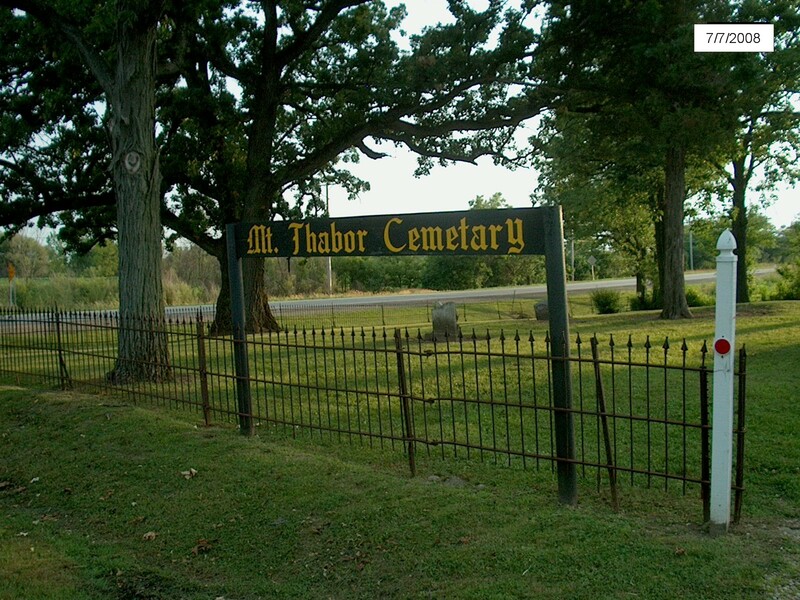 Thabor Cemetery, which is located at the intersection of Illinois Route 176 and Mt. Thabor Road. The property was first owned by early McHenry County settlers, Owen and Catherine Dyer. In 1846, Owen Dyer deeded one acre of his land to the Catholic Church for $1. A small log cabin sat in the middle of the cemetery, and served as a place of worship. 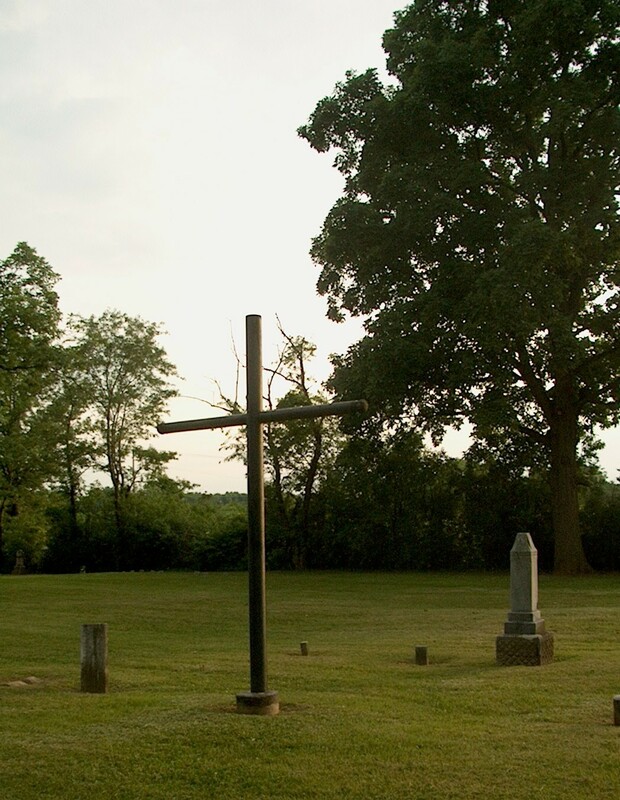 The church was referred to as the “Little Church in the Bush.” The only remaining reminder of the Church is a large cross, erected (at an unknown date) in the middle of the cemetery. Another reminder of the past can be found at the outhouse, which still stands at the northwest corner of Mt. Thabor Cemetery. One of the “residents” of Mt. Thabor Cemetery is Luke Gannon (d. 4/10/1869). At the age of 15, Luke arrived in the United States after a six week voyage from County Sligo, Ireland. He worked on the Erie Canal and then on the Illinois-Michigan Canal. In 1838, he married Margaret Fallon (also an immigrant from County Sligo, Ireland). The Gannons first lived in Dorr Township and then purchased a farm in Grafton Township in 1847. Their original log cabin (built 1847) has been restored and is on display at the McHenry County Historical Society Museum in Union, Illinois. In 1965, the cemetery was vandalized and many of the century-old headstones were smashed and broken. Click here to learn more about this unfortunate incident. The cemetery is no longer in use. Although it did serve as a baby burial site in the 1960’s, most interments occurred prior to 1890. Click here to see an early 20th century map of the cemetery. The information in this database was compiled from a variety of sources. The intent was to document as many of the burials known to be at the Mt. Thabor Cemetery. Sources include: Cemetery records, funeral home records, McHenry County Genealogical Society Index of 1987, newspaper articles and obituaries, county histories, and on-site inspection. Updates will be made to the database on an ongoing basis. This database is the product of many hours of work by Diana Kenney, who photographed the cemetery, as well as compiled and inputted the data. The Crystal Lake Historical Society recognizes and thanks Diana for her contributions. For additional information about the Crystal Lake Historical Society, please go here.